The Gay Gamer: Anybody want to spot me about $3,500 so I can buy this unopened copy of EarthBound? 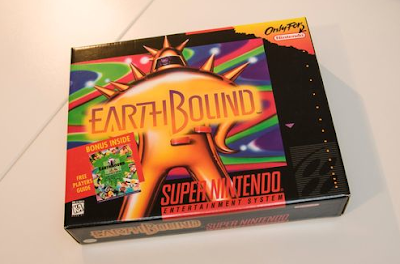 Anybody want to spot me about $3,500 so I can buy this unopened copy of EarthBound? Would I like to own a complete-in-box copy of EarthBound someday? No question. Would I like to spend somewhere between $1,600 and $3,500 on said copy? No way. If the activity on this ebay auction is any indication, someone's going to spend that much money on a copy of Shigesato Itoi's SNES classic within the next few days. Granted, the copy in question is unopened and appears to be in pristine condition, but even then I can't imagine spending that much money on it. I don't suppose any of you are planning to jump in on this particular auction before it ends on Thursday morning? Yes. Because I just won the lottery. BTW, Justin, did you kill Games with Boys??? Well, maybe if I had the money, but why I would have a game that I would not open to play it? but I want it anyway! hahaha What I'm saying, i even do not have the money to buy a used copy and I'm thinking of getting this hahaha. Ah, you definitely should pick up a loose cart sometime, Mineeva--especially if you already have the box and strategy guide! Ha! Actually, Simon, I'm also not a fan of leaving games unopened. What's the point? I'd totally love to buy an opened/used copy of this game--complete with box and strategy guide--someday, though. Yeah, people who hoard factory-sealed games make me furious (>.<) I'd like to break into their house one night and rip open all their games, then leave without taking anything. Grrr! I actually don't care that some people want to buy or own them. That's OK with me. I just have no interest in buying or owning them myself, as it seems pointless. Games are made to be played! I think I'd be willing to plop something like $300 on the SNES cart and guide (and hopefully box) someday, MH2882, but not anytime soon. That said, buying a Wii U and the digital version of the game is a good option, too, IMO. I also hope Mother 3 is released here at some point, although I'm not going to hold my breath waiting for it! Yeah, the price of this auction is nuts. I'm surprised anyone's willing to spend over $1000 on such an item. Oh, no, retr0gamer, I was just kidding. I'll get a copy of the game on my own someday, no question. I agree, though, that it's too bad it's become so expensive as of late. I was sooooo pleased when a friend sent me a mint copy of Mother 2 from Japan a few years ago. Only cost me £12 and as far as I'm concerned that entitles me to play the translated version :) It is a fantastic game, even if it is just a game built on top of Dragon Quest. But it doesn't ask for too much level grinding and is packed full of charm, which counts for a lot.